Bill Gates uses Android. That’s Bill Gates, the co-founder and former CEO of Microsoft who is still listed as a Technology Advisor to the company. And he uses an Android phone. That’s surely the strongest sign yet that Microsoft is dead in the water in terms of its mobile strategy. Since Satya Nadella took over as CEO in 2014, Microsoft has done great things. The company culture is changing, Windows 10 is one of the best versions of Windows ever, and things are looking up. Except when it comes to smartphones, a market in which Microsoft has completely failed to shine. With that in mind it shouldn’t come as too great a shock to learn that Bill Gates, who is, in many people’s eyes, Mr. Microsoft, has switched to Android Why I Quit Windows Phone And Switched To Android Why I Quit Windows Phone And Switched To Android In 2010 I bought my first Windows Phone device, beginning a love affair with the slick user interface and writing endless posts and user guides, generally evangelising the platform. So why have I switched to... Read More . Presumably from Windows Phone or Windows 10 Mobile. He admitted as much in an interview on Fox News, telling host Chris Wallace, “The phone that I have, recently I actually did switch to an Android phone with a lot of Microsoft software”. It’s a short but sweet admission that Microsoft has failed with regards to smartphones. The company has fallen short every time it has tried to compete with Android and iOS. Windows Phone showed promise but ultimately failed Windows Phone Is Dead As Microsoft Ends Support Windows Phone Is Dead As Microsoft Ends Support Microsoft has officially pulled the plug on Windows Phone, having ended all support for Windows Phone 8.1. There is still Windows 10 Mobile, but Microsoft doesn't seem to care about that either. Read More . And Windows 10 Mobile isn’t exactly setting the world alight. Gates didn’t identify which Android handset he uses. So it could be just about any you care to mention. However, his declaration that is has a lot of Microsoft software on it could indicate he’s talking about the Microsoft Edition Samsung Galaxy S8, which the company sells in its retail stores. What’s clear is that Gates actively chose Android over iOS. 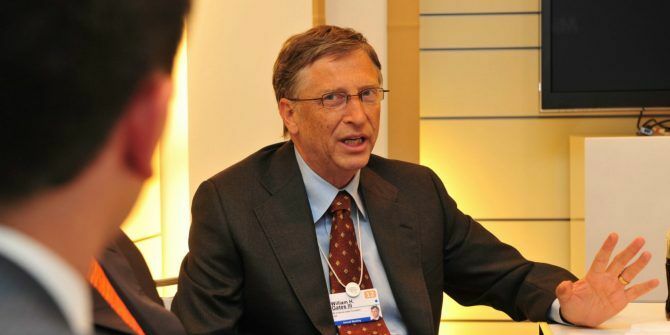 Because as much as Gates admired his frenemy Steve Jobs, he isn’t a fan of Apple. So much so that he’s alleged to have banned Apple products including iPhones and iPads from his home in the past, much to the chagrin of his kids. If even Bill Gates has decided Microsoft can’t hack it when it comes to smartphones I’m not sure what hope there is for the company in this area. Windows 10 Mobile endured a terrible launch This Is Why Windows 10 Mobile Was a Tech Launch Failure This Is Why Windows 10 Mobile Was a Tech Launch Failure When you're a dedicated Windows Phone user these days, you may get the impression that Microsoft hates you. How else would you explain this recent Windows 10 Mobile launch? Can we even call it that? Read More , and things haven’t improved since. It may be time to do the same as Bill and buy an Android instead. What operating system is your phone running on? Are you one of the few people still persevering with a Windows smartphone? Or have you switched to Android or iOS? How can Microsoft get back in the mobile game from this lowly position? The comments are open below. Explore more about: Microsoft, Windows 10 Mobile, Windows Phone. The problem is not Windows. The problem is (or was) the hardware. I had a 530 and a 650. The 530 is still working but the 650 was a disaster. I was and am convinced that the OS is great and that the problem is not the number of apps available. The OS is the best so far and one does not need so many apps (unless one wants to be part of the Android/Apple madness and be constantly scammed and convinced that he absolutely needs to use/buy the last useless app).The real big problem with Windows phones is the hardware. I live in Vietnam and the 650 was built a few kilometers from Hanoi. It was not possible to find spare parts or get assistance in Hanoi. Two months after buying the phone it started dropping constantly the calls.I went directly to the assistance centre and they refused to take the phone telling me to bring it to the shop. The shop took it and sent it to the same assistance centre. I got it back after 3 months.No replacement.The same phone but fixed. Except the back cover was cracked. Not possible to get it replaced and absolutely impossible to buy one. After a couple of months the screen started flickering and the audio started crackling. Another month at the assistance centre. One week after the guarantee expired the screen went black.And on again.And black again. I decided to put an end to his and my suffering.I absolutely loved and still love the OS and miss it. Android is a very poor substitute,for me.My money was good. I went to buy the 650 just a couple of day after it was available.The phone was a disaster and very poorly built and the assistance was a joke. And there was no way to talk to anybody. I know you're making a point about Microsoft's transition and Nadella's leadership (whatever that is) but... let's not get carried away. This two-headed hybrid OS & surveillance device is both a technical disaster and an affront to human rights. Gates would feel quite comfortable on a similar OS. If he had rooted and flashed it... I might have finally acknowledged some positive contributions he's made in the computing field instead of restrictive licenses, bloatware, FUD, the registry, MS Bob and a cpu-sucking word-processor. This should be a shock to no one. Windows phone is(has been) dead. And he's not going to chose iOS. Really no other option. Did anyone ever actually own/use a Windows phone? I wrote applications for PocketPC in the early 2000s and maintained them up until Windows Mobile 6.1 came out. A couple thousand people used them. Lots of businesses still use Windows mobile devices for things like inventory management. I think FedEx still does, for example. That's not a phone, but the devices are definitely out in the world. My guess is that BillG's personal choice had a lot more to do with not being able to integrate directly with Microsoft services by default, and/or a dislike of Apple's limited options for form factor than anything in particular about the platform. I'm an Android user because I appreciate the modular design. If there's something I don't like, I have the ability to change it (at least, as long as my phone's manufacturer isn't completely hostile to that idea). I like that I have a wide variety of features and form factors to choose from. iOS users can justifiably point to the mess that is Android OS and security, but techies at least have the option to look at the Pixel or devices that use LineageOS. Apple users are locked in to a limited number of devices with very limited feature sets. They can root their devices and put their devices at just as if not greater risk for issues than Android or the can choke the hit parade of Apple-imposed limitations. Because who needs file browsing, the ability to download arbitrary files from the web or for that matter to pick the software used to open a web link?